Much of India’s individuality comes from the interconnectedness if its many disciplines. From the arts, music and dance to the cuisine, medicinal practices and religion, each are viewed as a part of the whole that is one’s life; parts to be put in perfect balance with one another, always striving for the attainment of perfection and enlightenment. The spiritual, ritualistic and devotional structure of India is a glittering multiplicity of faiths, icons, systems and ways of living. The Bhakti cults is a system which germinated perhaps around the 5th century A.D. and made its most voluminous contrubutions between the 15th and 18th centuries A.D. The cult was concretized by the great Bhakti saints like Meerabai, Kabirdas, Surdas and Tulsidas. All saint singers who spoke and sang the language of the common folk extolling the virtues of and devotion to one supreme Lord. The Bhakti cult was a movement against the atrocities of the ritualism, casteism, untouchability and other aberrations which had crept into the formal religious practices. In prayer with Maestros… brings alive the cult of Bhakti in the voice of maestros who have dedicated their lives to music… who have in their own way spread the message of these bhakti saints. Pandit Jasraj was born into a musical family. A child whose inheritance from his departed father was just the seven notes, he was initiated into music b his father Pandit Motiramji, at the tender age of three. When he was six years old, young Jasraj was mesmerized by the soulful voice of the famous ghazal singer Begum Akhtar. ‘Deewana banana hai tho diwana bana de… ‘(make me insane if you please…) with the soulful strains of this ghazal sung by Akhtaribai Faizabadi, now renowned as Begum Akhtar, began pandit Jasraj’s musical journey. However, after the sudden demise of his father, pandit Jasraj opted for the tabla under the training of pandit pratapnarayan, as an additional means of livelihood in order to lighten the burden of family responsibilities. But, at the age of fourteen as a rebellion against the humiliating treatment given to accompanying artists, young Jasraj vowed never to be an accompanist, and decided to sing. Under the guidance of his elder brother Sangeet Mahamahopadhyaya Pndit Maniramji and Maharaja Jaywant singhji waghela of saanand he began his musical journey which unknown to him at that time was the beginning of his quest for divine…in music as well as the realm around him. Pandit Jasraj is blessed with a rich, soulful and sonorous voice which traverses effortlessly over all three and a half octaves. 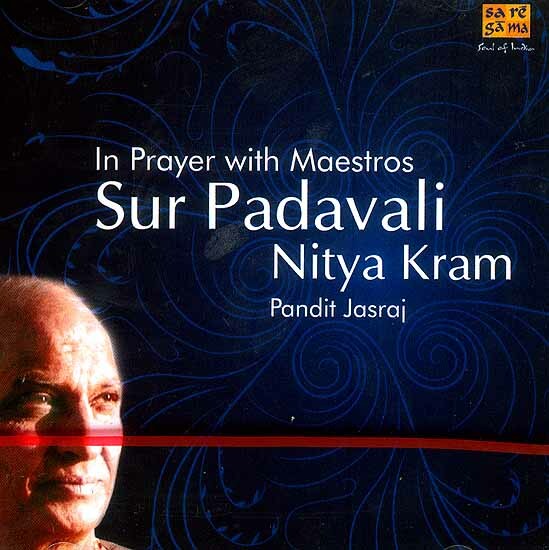 The highlight of pandit jasraj’s vocals is his perfect diction, clarity in sur and extreme tunefulness. Pandit jasraj’s greatest contribution to Indian music is his conception of an unique and novel jugalbandhi based on the ancient system of moorchanas, between a male and a female vocalist, each singing in their respective scales and different ragas at the same time. Pandit jasraj is the recipient of several honors and awards including padma Bhushan, surer guru, Sangeet marland, Sangeet kala Ratna, sangeet natak akademi award, Maharashta gaurav puraskar, and Dinanath mangeshkar award.